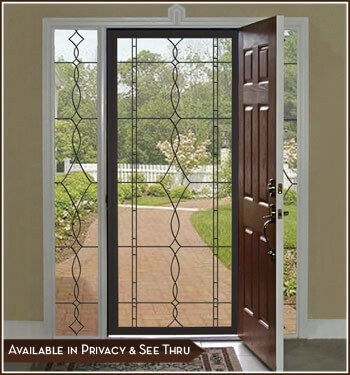 Our new leaded glass designs give an upscale new look to glass doors, side lights, windows, mirrors and more. Featuring looks that range from contemporary to traditional, our leaded glass designer window films are an easy way to give an ordinary door a custom new look with the added benefits of UV protection and energy savings. Shown above is our new Allure design, which is available in a variety of sizes to accommodate the many different sizes of glass doors; sliding glass doors, French doors, storm doors, shower doors and entry doors. The Allure Leaded Glass design is also available in a privacy version, click here to see the Allure Leaded Glass privacy version. Like all Wallpaper For Windows window film products, these new leaded glass designes are easy to apply, Phthalate-Free and will look great for years. This entry was posted by Design Team on March 30, 2012 at 9:55 am, and is filed under Basement Windows, Bathroom Windows, Decorate Glass Doors, Decorate Windows, Garage Windows, Glass Storm Doors, In The News, Kitchen & Dining Room Windows, Living and Family Room Windows, One-Light Glass Entry Doors, Sidelights, Sliding Glass Doors, Standard Windows, Transom Windows, Window Film Basics. Follow any responses to this post through RSS 2.0.Both comments and pings are currently closed.